With all of the excitement about The Hobbit at the moment, I decided to get into the action and re-read The Lord of the Rings (it makes sense to me!). Although I’ve lost count of the number of times I’ve read, or been read, the story, it has been at least six years, and my memories have become clouded by the movies. Also, this will make the first time I’ve read the book in Oxford (a.k.a. Tolkien-town). I don’t know if that is significant, but it might be. So, I slid my copy of The Fellowship of the Ring out of the slipcase and got to work. My copy is part of the tenth printing of the second (revised) edition put out by Houghton Mifflin Co. It is copyright 1965, but I’m not sure of the printing date. I bought it while working in a used and antiquarian bookstore in Chapel Hill. I don’t think it is in anyway valuable, but it is a very nice edition. The dust jacket has only the title and author, in a runic box, on a mottled background. 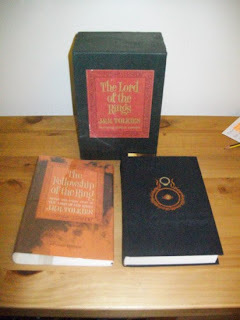 The book itself is bound in cloth boards, with a foil embossed graphic of the ring and the Eye of Sauron surrounded by Elvish script. Each of the three volumes has a roughly folded map attached to the inside back cover. Over the last couple of days, I’ve managed to read the first hundred pages or so, and it has been like revisiting an old friend. Many people, when they first read The Lord of the Rings, find the opening long and dull. I can understand this. There is so much action to come, it is easy to get impatient to get there; but now that I’m a bit older, wiser, and more learned in the ways of Middle-Earth, I am able to take it as it comes and enjoy the beauty of Tolkien’s prose and his powers of creation. This part of the book shares a pleasure similar to putting your feet in front of a warm fire on a cold winter’s evening. Although I’ve been blessed with a pretty good memory, especially when it comes to reading, it is amazing how much I’ve forgotten in just six years. Do you remember that at one point Gandalf actually holds the ring? Yup, he picks it up out of the fire to reveal the writing. Do you remember Rory Brandybuck, the one hobbit at the birthday party who doesn’t take Bilbo’s disappearance as prank, but thinks there is something bigger at work? Do you remember that over seventeen years pass after Bilbo leaves before Frodo sets off? Well, if you don’t, it’s probably time for another reading! I accept and understand why Peter Jackson left so much out of the movies, especially the sections set in Hobbiton, but there is a lot of richness there. The first encounters with the Black Riders, the Hobbits meeting Gildor Inglorion, the generosity of farmer Maggot. I do also give credit to Peter Jackson for working back in little elements of pieces that had to be left out. In The Return of the King movie, Pippin sings a song to Denethor, the words of which come from a song sung by the Hobbits as they are walking in Hobbiton. In my opinion, it’s one of the best moments in the movie. I'm only just setting out. It makes me happy to know that I’ve got 300 pages more in this volume and two more volumes to follow. I plan to finish The Fellowship before Christmas, and leave the other two for 2013. Well, I’m done cycling for the week and possibly for the rest of the year. I came off my bike again this morning. I was rounding a corner at the bottom of a hill when I hit a patch of invisible ice, and the wheels went out from under me. My left knee hit first, followed by my hands, and I ended up sliding a on my belly for a meter or two. Thankfully, it was on an infrequently used backstreet, and there was no traffic. My first thought was to panic over my recently healed shoulder, but a quick check seemed to confirm that it was fine. My knee and right wrist, however, were not so good. I dragged the bike off the road and sat down on a nearby bench, just as the shock set in. For a few minutes, I was light-head and nauseous, but it passed. Then I checked my parts. My knee had a serious bruise but seemed to work okay. My wrist had full movement but hurt when I applied pressure. 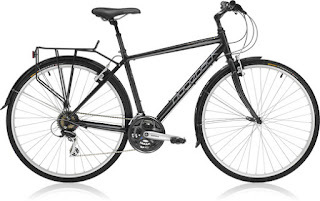 I pushed the bike the last mile to work, where I gratefully collapsed into my chair. A few painkillers got me through the day, and now I’m safely at home, banged up, but I think uninjured. For now, I’ve had enough. Earlier this year I was very lucky that when I broke my shoulder it didn’t prevent me from going to Africa. Considering how much I’m looking forward to flying home for Christmas in a few weeks, I just don’t want to risk it. Even more than usual in the winter, Oxford is a very wet place at the moment. At 7AM when I set off to work, there is a lot of frost on the ground, and thin sheets of ice everywhere. My cycle route is mainly over back roads and little used cycle paths, which are prone to puddles and standing water. I will reassess if the weather warms up a little, but for now, I’ll grab my book and take the bus.